Egypt has survived two consecutive revolutions, but managed to remain intact. While other nations have been plagued by a rise in sectarian strife, Egypt has remained what it was – a secular state. Amid the chaotic bloodbath in the Middle East, it is pursuing its own foreign policy and mending ties with Iran, while maintaining its friendship with Saudi Arabia. With trouble threatening Egypt from Syria and Libya, should Cairo become more involved in the region’s troubles? Could it serve as a balancing force, or would it risk opening its doors to instability? 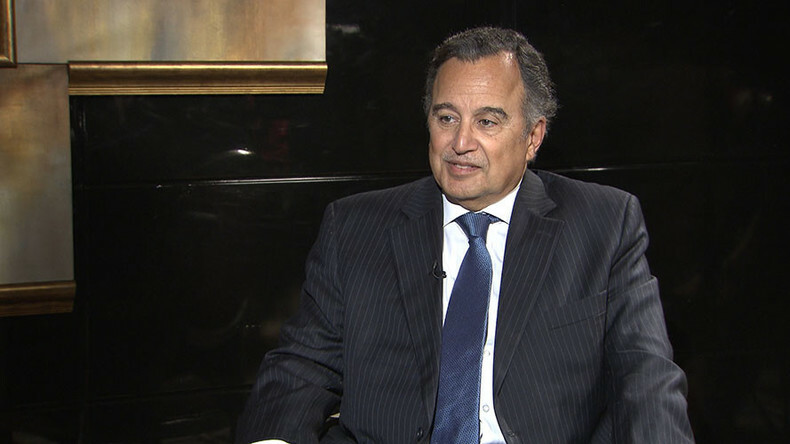 We ask Egypt’s former foreign minister, Nabil Fahmy. Sophie Shevardnadze: Nabil Fahmy, Egypt's former foreign minister, it's always a pleasure to have you on our programme - welcome, sir. Nabil Fahmy: Thank you for inviting me back. SS: The Wall Street Journal reports that Washington is pushing for a plan to create a pan-Arab military alliance - that is supposed to even partner up with Israel. Egypt and Israel. What do you think of that alliance and are the Americans being realistic here? NF: I'm not a big fan of alliances, frankly, but in terms of a pan-Arab alliance that, actually, on paper, the Arab League has a common defence force and it has a common defence agreement, so, Arabs, I think, should activate that agreement, because there are very significant challenges to Arab sovereignty, Arab states, the need for quick deployment forces, early deployment forces. I think, in the future, when we have a comprehensive peace in the Middle East, hopefully, when things stabilize in Levant and Syria and Iraq and so on - the Arabs can then also talk about what is the security paradigm with the neighbors, the non-Arabs: Turkey, Israel and Iran. But, that's - for me - a little bit too early to do now. SS: Still, it's very curious, everyone's wondering what's going to happen if Israel and Egypt can partner up in this agreement. NF: I don't think that we can partner up with a non-Arab for something in the Arab theater, but we can definitely cooperate with Israel regarding border security between us and the Israelis - we'll cooperate with anybody in the world on anti-terrorism operations, antiterrorism activities being Arab or non-Arab, but in terms of having an alliance, so to speak, or the coalition, the form of coalition in the form of NATO or in the form of Warsaw Pact - I don't see that happening outside the Arab world in the short term. SS: So, America also wants Arab states to partner against Iran. Egypt’s ties with Iran have been warming recently - the countries positions align in Syria, Egypt’s officials have met with Iran’s foreign minister. Is Egypt prepared to adhere to the pan-Arab confrontation with Iran? NF:We have serious reservations regarding... what we think is that Iran is overreaching in its foreign policy at the regional level, becoming directly active in the internal affairs in some of the Arab countries, especially in the Gulf area - so in that sense we have our concerns. At the same time Iran is an important country, it's a long heritage, a country we respect. So, I think, we have our differences, we need to talk them out. If and where there's a direct threat to Arab national security in the Gulf we have made our commitment to supporting Arab security in the Gulf, but our objective is to pursue that, frankly, through diplomacy, try to resolve these matters and to have a more stable regional environment. SS: Everyone knows that Saudi Arabia has been the main backer of the Egyptian government - bailing it out of a tough economic situation - but recently, Egypt’s friendly diplomacy towards Iran and Assad’s Syria is not making the Saudis happy, they've cut the oil imports. What is Cairo hoping to achieve, is it not afraid of losing an ally in Riyadh? NF: First of all, the Saudi support traditionally and even now has been appreciated by Egyptians. That being said, and frankly, I'm the one who announced this in 2013, after the 2013 revolution in Egypt - I came out publicly and I said: "We will expand our relations with friends, but make more friends at the same time". We don't want to have dependency or over-dependency on anybody, even our closest friends. So, the fact that we will pursue the relations with our friends, and the Saudis are... family, not only friends - but also talk to other, it's within our policy. Now, our talking to others - and I've said this just now - we have issues with Iran, we will talk to them about these issues, but I don't see our relations with Iran in any way being at the expense of Saudi relations. Do we have differences with Saudi Arabia on Syria? Yes we do. We don't have a difference on a strategic goal, which is to preserve Syria as a sovereign state, but we clearly had a difference in terms of a priority of what we do first to get to that stage. Denying the difference isn't going to change it, so I'm very frank about it - we are family, we are friends and family, and we will agree on a lot of things and differ on a couple. SS: Do you think Iraq and Iran are capable of taking over Saudi Arabia as Egypt's main oil source? NF: No, I don't think so. I think we will be making a major mistake if we depended too much on anybody, frankly, in oil or money or whatever it is. We will continue to encourage relations with our Arab friends primarily, but with everybody as well. But at the same time, I don't want any dependency on any particular Arab country, or, as we did, for example, with U.S. and Russia. I'm the one who came to Russia immediately after 2013 and I sat with Sergey Lavrov - a good friend and an exceptional professional - and said openly: "I didn't come here to replace America by Russia. I came here because I want to expand with America, and I want to expand with Russia out of respect for my own country's interests and respect for you". SS: The idea of creating a united Arab military force has been floated around by President el-Sisi in 2015 - the creation was even supported by the Arab league but at the end of the day didn't work out because work out due to differences between Egypt and Saudi Arabia. Is it even possible to create such a force, especially if there are disagreements between the two major players? NF: It's clear that it hasn't happened because of these differences. The differences weren't on the principle directly, but were.. at least the technical reasons that stopped it were the like location, leadership and all of that - but ultimately, if the political will was there, we would've gotten over these differences. For the time being, I don't see this happening. At the same time, if we're talking about creating coalitions with foreigners, then I would create coalitions first among family, and I don't mean family in the nostalgic sense. I am a former diplomat and politician, I look for real interests. The real interests for Egypt, for example, which is not sectarian, is to preserve the nation-state in the Arab world, particularly the Arab nation state, respecting all of its different constituencies, not ignoring them. There are non-Arabs in the Arab world and we need to respect them, but that's for me, for Egypt, preserving the nation-state is a national security priority. As much as diplomacy is the preferred tool, ultimately you need to be able to back up diplomacy with hard assets, if threatened, in that sense, and therefore, having a defence capacity is imperative - domestically, for each one of us, but also, frankly, having a regional defence cooperation - because of problems like terrorism, problems like sectarianism, which don't stop at the borders. SS: So what do you think of this whole idea of "Muslim NATO" that Saudi Arabia has proposed, that is supposed to fight terrorism, it's aimed against ISIS. Do you think that could be doable? NF: I think it's important here to look at this in terms of particular theaters, particular issues. You don't have to have... this is not an Arab NATO, or a Muslim NATO, nor is it, frankly, an Arab or Muslim Warsaw Pact. This is about dealing with issues of terrorism. So, if we will agree with the Turks, for example, to deal with terrorism in certain areas - well, let's cooperate with them on that. If the problem is somewhere in Asia, and then you have more muslim countries there - that's fine... I'm not a big fan of "all-or-nothing". I'm much more practical, in a sense that coalitions are necessary because these are cross-boundary issues. Terrorism don't take visas... at least, in most cases they don't take visas. Their money is cross-boundary. If you look at how ISIS has disseminated from the Levant area, now into Libya, and there's a lot of talk about some of their presence in Sinai - and you will see terrorists - as the theater for ISIS operations decreases - you will see terrorist acts increasing worldwide, because it will move back to the traditional terrorist approach rather than trying to create a state on territory. If we don't work together - it doesn't work. Now, when there's a military theater, you need to have a military force, and that involves more than one country. If you look at the ISIS problem in Syria and Iraq, they are related. You cannot stop it in Iraq without stopping it in Syria, and vice-versa. Very significant support coming in for ISIS leaders and operations, for years, is coming through Turkey. Through the Turkish borders - I am being very frank. So unless you get these people to cooperate, you're not going to succeed. SS: Looking at Europe right now, despite the fact that it became a terrorism target lately, the European states don’t have a common intelligence pool - what about Arab states? Arab states are also faced with terrorism every day. Do you exchange intelligence? Is it possible to have an intel sharing structure in the Arab world at all? NF: That's an excellent question frankly, because we've lived through that problem. Whether it was in the 80s, when Egypt was facing terrorist problems, or, frankly, even 9/11 - at that point I as an ambassador in Washington - the most difficult problem was to get the intelligence agencies and the security agencies to cooperate with each other. They are trained not to provide information to anybody, they are trained to gather information and to use it. So when you go to talk to them and say: "you need to exchange information" - it's almost against their culture. That being said, I think they're learning that if you don't cooperate with each other, you will ultimately see loopholes in your system. That was obvious. In almost every country where there was a terrorist act - there was some indication of information but the agencies didn't cooperate with each other in doing that. So, is there enough? Is cooperation intelligence issues? There is, but not near enough, frankly. It needs to expand significantly. We made initiative in 2013-14, we announced initiative in Egypt that we wanted the Arab interior ministers to create such an agency. It hasn't happened yet. SS: Egyptian forces, allied to Saudi Arabia, aren’t playing that big of a role in, for instance, the war in Yemen - is Egypt ready to be a more involved part of a conflict, part of this bloc? Is Cairo prepared to send its troops to fight for this war? NF: As a matter of tradition and principle, we're not really... we don't send troops outside of Egypt easily. Our previous Yemeni experience, in early 60s, was traumatic, so sending ground troops into Yemen was never really an option. We provided some air support and some maritime support, but there is clearly no readiness to provide grounds troops and I don't see Egypt doing that. Where I see a possible stronger Egyptian military presence, although more on the border then inside, is in Libya. I think that Tunisians, Algerians and Egyptians need to bolster their border security provisions from within their own borders, but that's the area where there could be some more operations. SS: Also, in the Sinai peninsula, ISIS-affiliated terrorists have been gunning down Egyptian Coptic Christians. The Egyptian military has been battling ISIS militants there for years now. What do you think, why can't they just sort of contain them? We can't they contain this spread of ISIS? NF: Several reasons. Initially, we ignored Sinai for too long, so, even before ISIS, extremists and terrorist operations mushroomed in certain parts of Sinai, not on the borders, but in the certain parts of Sinai. That was the initial problem. Thirty years of mistakes and ignoring of development in Sinai. Then, were the Arab "Awakenings" in 2010-onwards. Border security on the Libyan side broke down completely, as did border security with Gaza on the other side of Egyptian border. So there was a free flow of weapons, money, people coming in and out for a period of time. That really created the huge problem. The third problem is now the terrorists are in and out of civilian areas, so if the military was to simply use military measures, you'll have tremendous amounts of collateral damage. So, they are trying to be very forceful, but at the same time not cost collateral damage that would end up hurting civilians and then leaving very bitter sentiments vis-a-vis the government in a longer term. It's a complicated issue, we need more cooperation not only with our neighbours but with the international players - the point you've made earlier about intelligence information, who's supporting whom financially and so on and so forth. But, it's a nasty problem, frankly. But it is limited to a geographical area in North-Central Sinai and the last incidents that targeted Copts in particular were condemned by everybody in Egypt, across the board - whether their politics were right-wing or left-wing, Muslim, Christians, everybody condemned it very severely. The only people to support it were the ISIS and their equivalents. SS: So, is there any truth to the AP report that Christians are fleeing Egypt in waves right now? NF: Not that I'm aware of, frankly. An incident like this will, of course, raise some anxiety, but I actually believe that Christians understand that Egypt has centrist society, focusing on civil ethics of our present Constitution - everybody is equal. As a reflection of this, President Sisi, in particular, since he was elected, has been going yearly to the Coptic Christmas celebrations, whereas no Egyptian president has done that before. So, he has made that point. I don't think that there are large numbers leaving Egypt because of the most recent events - I would, frankly, hope not. These are condemnable incidents, we need to work against them, but for me, Christians and Muslims are all the same in Egypt. SS: So you don't feel like there's a slightest chance that conflict between Christians and Muslims might spark in Egypt? Because Christians in Egypt are saying that the government isn't' doing enough - even though you were saying President Sisi is doing much more than anyone else. NF: I think we need to do more. In other words are we doing enough? No, we need to do more. We need - particularly in the education system - to promote all this. Look, I am a Egyptian national, I grew up between Egypt and abroad - we never bothered, in the past, in our schools, to ask whether... well, we knew, because we had different religion classes, but we never really factored in whether my colleague was a Christian or Jew, for that matter. We had Jews, Muslims and Christians at the same schools. It's not that way today. Religion is more of a factor today than it was in the past, and we need to go back to this: country is for all, religion is between you and God. SS: Moscow really wants Egypt to enter the Syrian settlement talks - Cairo has been hosting Syrian opposition talks. It's also supporting the Assad regime in Syria. Do you feel like Egypt’s ties to both sides of the conflict is actually bringing the Arab voice into the Syrian peace process? Because there's no Arab voice in this conflict - there's any voice but Arab voice. NF: Let me start with your conclusion. I have exactly the same concern you do. I don't understand how there cannot be an Arab voice on Syria. The second round of the Astana talks only had Jordan as an observer - and that's because of the intelligence issues per se, and they are going to be the next head of the Arab Summit. But the absence of an Arab voice is, frankly, an aberration and unrealistic. I think Egyptians should be more vocal and more prominent in suggesting political steps forward. We support the Syrian state. Who governs Syria is for the Syrians to decide. For us, we don't to divide Syria on ethnic or sectarian basis, which is the plan some people have, by the way. So we don't want, because we'll have a domino effect throughout that part of the Arab world. So, that's what we support. Whether it's Bashar or not Bashar is not our problem. But I think it's important to have contacts with both sides - you cannot help solve a problem if you only talk to one side. So, again, even as an Egyptian, more than my Russian friends, I call upon Egypt to be more active, more vocal in presenting political suggestions on how to move forward. They will not all be accepted, if they will, then there would not have been a problem, originally. But diplomacy is not about coming up with miracle solutions, it's about process of bringing people together. SS: Then there's Turkey, also, that doesn't want Egypt to be on board with Syrian peace talks. What's going to happen now? How do you make sure that Turkey-Egypt antagonism doesn't harm the Syrian peace talks? NF: I think, it does. Frankly, it does. And it's not about Egypt-Turkey as much as it is about Turkey's approach to the Brotherhood and to the political Islam, and Egypt's counter-posed to that. And that's the problem between Egypt and Turkey. It's not the competition in the Levant, we have no agenda in the Levant, except the preservation of the Arab nation-state. Our problems with Turkey or their problems with us, frankly, are - they are the supporters and hosts of the political Islam and we don't support political Islam. So that's really where the conflict is. They have supported at different points in time, what they call "the Syrian opposition", but Syrian opposition went far beyond, if you want, the military opposition to a religious opposition and to some extremists. Now, they are tempering their posture a little bit... but I agree with you, I'm a strong supporter of a Turkish-Egyptian dialogue as well the Iranian-Saudi dialogue. But I don't see either of them starting anytime soon, because both of them require some confidence-building measures just to create an environment for a serious discussion. NF: I think what you're saying confirms my point, really. We've been receiving U.S. aid, military and economic, for 30-on years, since the Camp David agreement back in 70s, and during that period we've had peaks of agreement with the Americans and frankly, ebbs of disagreements - when they entered Iraq. When they liberated Kuwait, we were very supportive. When they entered Iraq, we were in opposition to their position, we were very tough in support of the Palestinians and the peace process - they were not. As you've mentioned, with Obama, relations were quite cool. But the aid continued, and what that basically means is - it's mutually beneficial. It, no doubt, serves us, our economy and our military. At the same time, if they did not think that supporting a centrist, important country in the Middle East servs their strategic interests of ensuring that Middle East was moderate, centrist, does not go too far to the extreme, to the left or to the right - they would've stopped the aid a long time. So, I look at this as a mutually beneficial relationship. I, personally, would hope that sometime in the not too far future we would not be dependent on foreign aid. But, the reality is, whether it's because of our economic situation or because of the need for us to revamp our military capacity and increased military capacity - we will engage in strong relations with foreign countries - America, Russia and other countries - because of that. We'll have to deal with this aid issue and what people expect of us in response for the aid. The point that I would recommend to any of our friends is that if you look at Egypt's history, what you should understand is that you will get a good friend, but you will not get somebody who's a follower. And if they expect otherwise, they would be frustrated. SS: Thank you very much for this interview. We were talking to Nabil Fahmy, Egypt's former Foreign minister, member of the Valdai Discussion Club, here in Moscow's Lotte Plaza Hotel and we were talking about Egypt's role in efforts to bring peace to the region.